Bjango's iStat Menus system monitoring app returns with a redesigned interface, a separate preferences app, and new features. 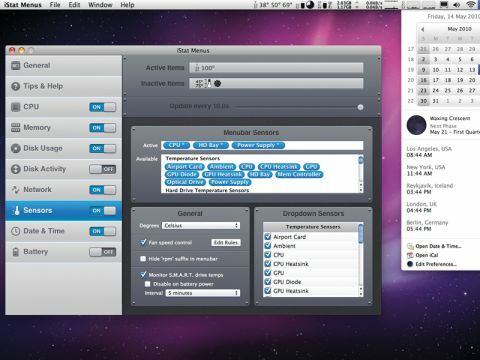 The app's functionality remains broadly the same – 'widgets' can be added to your menu bar to monitor things like CPU, network, memory and disk usage, component temperatures and time. Drop-down menus provide additional details for each widget, along with access to preferences, which are now housed in a smart standalone app rather than System Preferences, simplifying installation. Of the new features peppered about, fan control is probably the best, enabling you to directly control fan speeds for Intel Macs. There's also a battery extra, monitoring of Apple Wireless Keyboards, and the fantastic Date & Time module now sports sun and moon info, optional flashing time separators and a 'fuzzy' clock (approximate, text-based timekeeping). Long-time users will also notice one other major change – iStat Menus now has a price tag, rather than being 'donation-ware'; however, we've always argued that it's an app well worth paying for, and $16 seems good value to us. We've been using the upgrade since the second it came out, and are delighted to report that the app remains rock-solid stable and dependable. Some users reported issues with the fan-speed features, but they've been dealt with in the 3.01 upgrade. To that end, iStat Menus remains a first-rate addition to any Mac; in fact, as far as we're concerned, a Mac feels a little naked without it.